When a blockbuster movie rakes it in at the box office, what better way to ensure its legacy than turning it into a slot spin-off? This presents the gaming audience with the opportunity to relive the setting of the story, and even interact with the protagonists. Here’s a rundown of some of the best slots out there that were inspired by our favourite movies. Many films have been created with the Kryptonian character at the helm. Playtech’s take on the beloved character falls nothing short of spectacular with its locked wilds as well as the crystal bonus with up to x5 multiplier. The game features 4 mystery progressive jackpots. There are 100 paylines and 5 reels. The Superman logo is the wild symbol, which can substitute all but the free spins and the bonus icons. The bonus rounds include free spins, multipliers, new slots, progressive jackpots, scatters and the wild symbol. The bonus icon can land on the 2nd, 3rd and 4th reels only. Free spins are launched when special symbols land on reel 1,3 and 5. This game features the characters from the original movie series with the iconic Christopher Reeve in the title role. 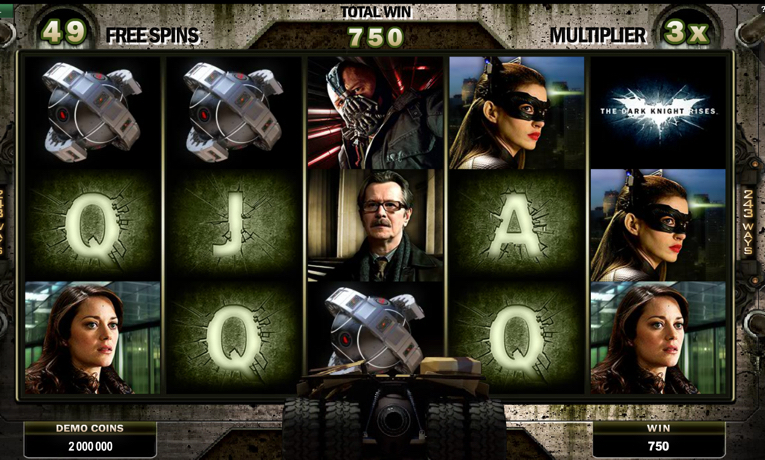 Microgaming delivered a 5-reel slot with 234 paylines, based on the popular reboot of the Batman franchise. The images are synonymous with the movie, and include the Batman logo, the Joker and Harvey Dent. The visuals throughout the game are superb. The game also contains that cinematic spin feature that shows clips from the film whilst playing, which is a treat for fans. Even better, the game offers progressive jackpots, which have reached the millions in the past. The wild symbol is the Dark Knight logo, whilst the scatter symbol is a combination between the Batman logo and the Joker face. Where the 2011 blockbuster movie failed, the slot machine has succeeded! The film sees the character of Hal Jordan (Ryan Reynolds), a test pilot who was chosen as a member of the Green Light Corps and bestowed with a ring that grants him superpowers. However, he must face Pallax, who is threatening to upset the universe’s balance of power. Brought to you by NextGen Gaming, this is a game that is visually superb, with a Collapsing feature where the player can win multiple times from each spin as winning symbols disappear to be replaced by new ones. The Fear Flight Mission contains unlimited free spins until you cover reels with up to 8 stacking wilds. The Training Centre Mission feature offers you 10 free spins with extra wilds such as grenade, missile and punch wilds. This is a 5-reel game and there are 234 ways to win progressive jackpots which could be categorized as the mini, minor, major and grand jackpot. With its picturesque and storybook backdrop set in the English countryside, Robin Hood robs the rich to provide for the poor, with the help of his Merry Men. Many movies have been made about the honourable outlaw, but when it comes to slots, one provider has created the ultimate Robin Hood game; the ever-dependable NetEnt. The slot has 20 pay lines, 5 reels played on 3 rows, wild symbols, a Shifting Reels feature and 3D graphics. You can spin the reels to discover archers, knights and friars. There are bonus rounds to be saved from the clutches of the Sheriff of Nottingham and the evil King John. Locking lips with Marian is an extra reward! Gambling is a big feature of mob movies, so it makes sense that there would be a slot inspired by the Godfather of them all. Whilst the movie is known for the number of awards it has amassed, the online casino game from Gamesys bestows the awards on its players. Prizes are won for Italian mobster themes such as meatballs and spaghetti, red wine, mob bosses, guns and of course the Godfather himself. The vast array of features and bonuses it offers include Bonus Wedding Cakes, Wild Horses Heads and Stacked Wilds. The game has three standout features: Family, Respect and Money. The Family feature is where the Godfather will gather together Don Corleone, Luca Brasi and Philip Tattaglia into a “Family Business” icon. Unlock the all-important Respect feature, where up to 5 Wild symbols are added to the reels and earnings will be doubled. The badge featuring the black horse is the wild in this extra game. With the Money feature, you will be in the position of the Godfather making you an offer, which you may or may not be able to refuse. After winning 10x, you can either take your 10x, or his mystery multiplier with the consequences it may carry. The Godfather slot machine has up to 25 bet lines and a RTP of 95.77%. Here is just a taste of the many great movies that have inspired slot games, and if superheroes or gangsters are not your thing, then there is sure to be something on the market to suit your tastes. From fairy tales to horror flicks, movie fans have a lot of ways to spin. Check out available freespins here. Check our earlier piece about other movies that inspired Slot Developers.